These groups have profoundly affected political rhetoric and the subsequent legislative landscape for decades. Recent polls have shown a majority of Americans would like to see Congress pass some kind of gun control legislation. But why has it taken so long for such policies to move forward? One key reason is the amount of campaign contributions issued to politicians who occupy vital positions that, inherent in their position, facilitate the creation and passing of legislation. After taking Professor Anna Fodor’s Legislation class, I have learned, for example, the Senate and House Judiciary Committees and their respective subcommittees are the frontline entities that formulate gun-related legislation. (Because gun legislation is the topic, these are the two committees to which a gun bill would be referred. More specifically, the committees are the House Subcommittee on Crime, Terrorism, Homeland Security, and Investigations and the Senate Subcommittee on Crime and Terrorism.) These committees, like all Congressional committees, are where a very high percentage of bills go to die. 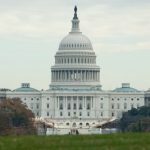 If a bill is able to survive and receive committee approval for a floor vote in a respective house, majority leadership in either house of Congress has incredible procedural influence on how and when a bill is considered on the floor. Then, if a bill surpasses a floor vote and the likely amendments that result, the Vice President and President are also individuals who have immense power to affect the speed of legislation. Beyond the procedural mechanisms these key individuals can employ, each of these individuals, due to his move up the institutional chain, has an increased degree of political influence over his subordinates. Below I have compiled a chart of the individuals who will have enormous influence over the furtherance of any gun legislation. 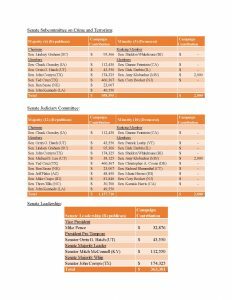 Next to each of these individuals, I have listed the amount of campaign contributions they have received from gun rights groups. All campaign contributions occurred between 1989 and February 1, 2018. These charts do not consider contributions made to a Senator or Representative’s presidential campaign. Click on the above image to open the full set of charts. In summation, as one can see, gun rights groups have maintained active involvement in their support of politicians occupying positions that have significant influence on the furtherance of gun legislation. A gun-bill that could be perceived to restrict the use of firearms in the United States will be met with steep opposition. In the coming months, we will see whether the gun rights groups’ reign on Washington D.C. has ended. The power of the people on its face outweighs the aggregate power of gun rights groups—but will that be enough? This information is accurate as of March 12, 2018. On Saturday, March 24, hundreds and hundreds of thousands of people in hundreds of cities across the country participated in the student-organized and student-led March For Our Lives, demanding Congress address and pass common-sense gun control, like Michael mentions above. It will be interesting to see which voice Congress hears: the moneyed “voice” of the NRA or the passionate but less moneyed voices of more than three-quarters of a million people. Democracy would demand one result; the Citizens United decision suggests another. Previous Previous post: Will the Foxconn project “transform” Wisconsin’s water resources?